Below is some analysis of the Crealock 34 and Crealock 37 vs. various "ideal" designs. It is based on the excellent database and spreadsheet that I downloaded from John Holtrop's www.johnsboatstuff.com circa 1998. (the download link is towards the bottom of that page) [24Aug2012: I see his site is gone. I've changed that link so it now goes to the web.archive.org cached copy] In the way of background, here is an article from Cruising World, April 1998, written by Holtrop. Also see his articles, Design Basics and Best Offshore Cruising Boats. The quotes in the lower right corners of the graphs below were mainly from Holtrop's spreadsheets. The other annotations on the graphs were from various sources (any errors are no doubt mine). And I can't repeat it strongly enough - this is mostly from the work of John Holtrop, with a few other designers' "rules of thumb" scattered here and there. The worst conditions I've been in was a crossing from Key West to Isla Mujeres. It was the wrong time of year to be out there (January). I was about half way across when I got plastered by a 45 knot gale (blowing against the Gulf Stream). After a while I hove to and basically passed out from exhaustion. I thought Breakaway handled it very well though. The next morning the waves were up to the spreaders (I'm guessing 35'). A Coast Guard Search & Rescue plane flew over (I thought it was going to hit the top of the mast) and I contacted them on the radio. They asked if I was boat such-and-such. It had declared a Mayday and they were out searching for her. Last month, I got to spend some time aboard Panope, a 1988 Crealock 34 skippered by Edmund Hull. We made two offshore passages - one of 3 days from Barcelona to Corsica including a mistral with 35-40 knot winds and 15' seas. I thought Panope handled the rough conditions well and balanced easily under a range of conditions - as expected. Panope is setup similarly to Breakaway - cutter rigged with a Monitor Windvane, roller furling 130 degree genoa with a hanked-on staysail. Two reef points in the main with most of the control lines brought back to the cockpit. One difference though is that she has a separate sail track for the storm trysail. This is something that I've been meaning to add to Breakaway and have moved it up on my to-do list based on our experience. We sailed with storm sails through the night when the wind picked up as the mistral passed and switching from the double reefed main to the storm trysail was fairly easy with the dedicated track. It&apos;s been a while since I&apos;ve updated this page. Here is an article in Blue Water Sailing about that passage mentioned above from Malta to Crete. And here is an article he wrote in SAIL Magazine about a recent passage we, with skipper Jock, made from Puerto Rico to St. Petersburg, FL aboard ANNIE, Jock&apos;s Crealock 37. Panope is presently laying in her home port in Cyprus. I plan to crew on her again this Fall from Cyprus to Turkey to Rhodes. Sometimes I wish I had gotten the Crealock 37. It would have meant more space - a couple inches here and there would make a big difference down below. Also there would be more space for spares and stores and such. Plus a 37 would have been a little faster (0.2 knot based on their PHRFs) and likely have a little gentler motion. Still, Breakaway will be a little cheaper to maintain (hauling and slip costs for a 37 would be only slightly higher - 10%; but other costs like bottom paint, new sails, rigging, etc probably go up with the displacement - roughly 25%). Also, Breakaway is probably a little easier to manage - consider windage when hauling in the anchor in some wind, the weight of the chain+anchor and being able to pull up an all-chain rode from any depth (say, by hand quickly when you are single-handing and in a tight spot), setting/retrieving a sea anchor or drogue, docking, etc. I just watched a larger sailboat come into the harbour and circle around 3 different moorings. They hit ground at each and ended up tying up to the dock at the marina. 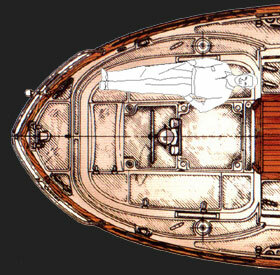 This reminds me of another desireable characteristic typical of a smaller boat - a shallower draft. Breakaway has the shoal-draft keel option (called the Scheel Keel). So she draws about 4'. The Crealock 37 with a Scheel Keel draws 5'. I know a foot difference doesn't sound like much but it really does help. E.g. "going over the bar" in Livingston, Guatemala was very easy with a 4' draft. 5' meant being careful of the tides. 6' or more was tough. You spend a lot of time in the cockpit - either at anchor or under way. Another thing about the Crealocks that I really like is the cockpit - with nicely rounded, large corners to curl up into. Also, the combings are well rounded so it's not too bad when you knock into them or brace against them when the boat is in motion. One possible negative is that the locker clasps stick out. Somebody who was crewing on a Crealock 34 with a tiller arrangement was saying that he found himself hitting the clasps quite a bit when moving around the cockpit (and showed me the bruises on his legs at just that height). This is not a problem with a wheel steering configuration as the wheel pedestal prevents you from getting too close to the hasps. The tiller arrangement does make for a nice large open cockpit in port, and is obviously preferable by some for the feel of the rudder when underway. And it might be possible to replace the existing clasps for something more flush. I think the size of Breakaway's cockpit is just right. The seats are just long enough to sleep on. I "catnap" on overnight passages - sleeping for 15 minutes at a time. Sleeping in the cockpit is easier than going up and down to a berth below every 15 minutes. I've read that you don't want the cockpit too large on a bluewater boat in case a wave fills the cockpit. I've only had a couple small waves break into the cockpit - in a spot off the Yucatan Peninsula where the strong Yucatan Current and I believe a counter current meet and create strange wave conditions. The large scuppers seemed to drain the cockpit quickly. In each case, it was while I was asleep so kind of a rude awakening having a wave dumped on you out of nowhere :-). Breakaway's cockpit is IMO large enough to entertain comfortably at anchor or on an easy day sail. course, to see if it fits for you. Make sure, if you are shopping for boats, that there are good handholds in the cockpit to grab onto when the boat is in motion. The U-shaped pipe over the steering pedestal is my main handhold in the cockpit. And the support for the hardtop bimini is a little beefier than normal (1" s/s tubing supporting the front with 2¼" aluminum pipe for the aft "goalpost" support) that I can brace against it with a secure feeling. Also, see if you can brace comfortably at the front side of the steering pedestal - standing in the cockpit with your rump against it, looking forward. You spend a lot of time in the cockpit. It should be comfortable and functional. FYI, here is some background on the paper. The paper is actually trying to sort out the nature of cultural change. Polynesian canoe design is just the guinea pig. One of the characteristics that I really like about Breakaway is the canoe stern. Whenever I have her hauled out of the water, when she is in the slings of the travel lift or resting in the jackstands, I find myself occassionally gliding my hand over the contours of her rump. It just looks and feels so nice. I've read peoples' opinions that a canoe stern tends to behave better in a following sea (where the waves are overtaking the boat from astern) - parting the waves more easily and not letting the boat get pushed about as might occur with a flat transom. Following seas still make me nervous, but Breakaway always seems to handle them well. I have read that the double ended, canoe stern is based on the designs of Colin Archer and the original Norwegian lifeboats. Probably pretty good genes. At the bottom of this page are some plots of LWL vs average boat speeds as calculated above based on PHRF ratings for the Crealock 34 and 37 vs a large number of boats in John Holtrop's database (downloaded 16 Aug 2010). The 3 charts show the results for heavy, average, and light conditions. I've plotted the J/105 for comparison. I am in the process of repowering Breakaway and have put some notes regarding that here. CR34/C and CR34/S are the cutter and sloop versions of the Crealock 34. CR37/C and CR37/S are the cutter and sloop versions of the Crealock 37. Linear (Series) is a line through the data.